Four years later I applied for a service dog for Sebastian, only to be heartbroken when he was turned down. I’d spent months on the 15-page application for a dog trained in seizure assistance. But five minutes after the charity received my package, I got an e-mail saying Sebastian didn’t qualify. Because Sebastian is dependent on others for everyday tasks, they said he was incapable of bonding with a dog. Our search led us to a woman named Sherry at Swissridge Kennels. Each year she donates a dog to a family in need and organizes a fundraiser to help pay for the dog’s training. Sherry breeds Goldendoodle and Berndoodle puppies. I sent her a letter introducing ourselves and asked about that year’s fundraiser. I learned we were in the running! After a few emails back and forth, Sherry came for a visit. She even brought a few dogs to meet Sebastian. It was an exciting day for the whole family! After our meeting, Sherry decided that Sebastian would be a good fit for one of her puppies. Sherry wanted to wait until the litters would be born in the spring to choose the right puppy for Sebastian. It was a long winter! When we returned from our trip to Australia in May, Sherry had a visit planned to bring along one of the other women who helps with the Swissridge Doodle Romp charity, Karley. To our great surprise, when we opened the door we were greeted by Sherry, Karley and a new Goldendoodle puppy! Sebastian and this puppy immediately bonded. We were over the moon. 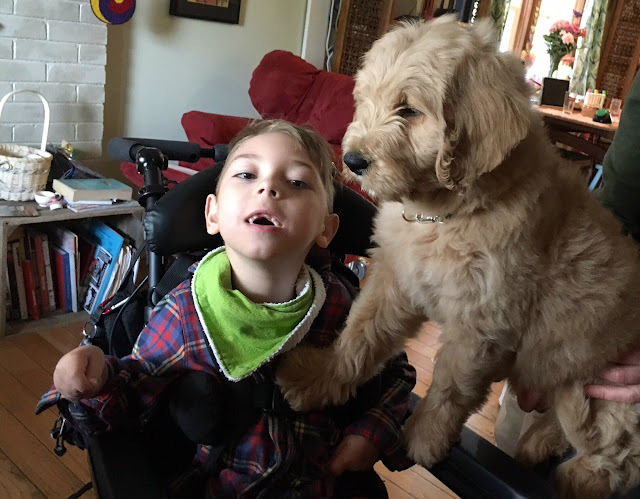 There would still be a long wait with training ahead but Sebastian had a service dog! Over the next two weeks we went through every name we could think of before Sebastian chose Ewok.Ewoks are a race of Star Wars’ creatures who look like furry teddy bears and have their own language. I used to call Sebastian my little Ewok when he was a baby because of the sounds that he makes (since he doesn’t use words like we do). I showed him a video of an Ewok and asked if he thought the puppy looked like it, and whether it would be a good name. He said yes! Ewok currently lives with a family to do his imprint training, which is the basic house training, obedience and socialization stuff. He’s started to work with the trainer and soon will live with him full-time for more intensive training to become a therapy and seizure alert dog. Once Ewok is ready, we’ll join in the training sessions twice a week. Then Ewok will come home with us, but we’ll continue to go back to Swissridge for training as needed. How does all of this get paid for? 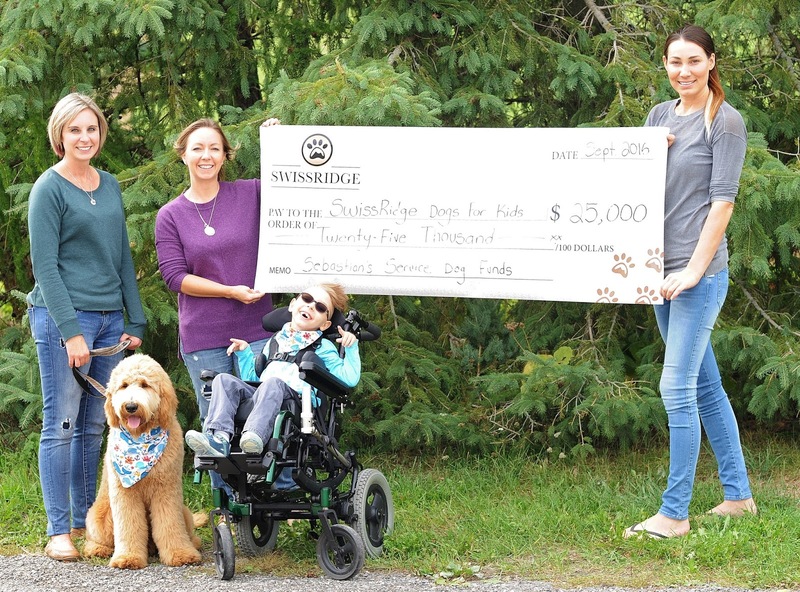 Through Sherry’s generosity and the community she has created with other Swissridge dog owners, all of the funds have been raised to pay for Ewok’s training. In August we attended the Swissridge Doodle Romp, a reunion of sorts for other familes that have Swissridge dogs. While people drive from all over to meet and connect with other familes and their Swissridge dogs, they also come to donate. And donate they did.This year the Doodle Romp raised over $25,000. We will not need to personally fundraise or contribute financially to Ewok’s care and training. We are so thankful to have been welcomed into this caring community. While at the romp several photos were taken and one now hangs on Sebastian’s wall while he waits for Ewok to come home. We hope that Ewok will help break social barriers while we’re out. We also look forward to Sebastian feeling a bit of independence as it will be his job to care for Ewok. Most Toronto parks are not inviting to kids using wheelchairs. As Sebastian gets bigger it is more difficult for him to be carried up and down the slides and sometimes even the inclusive swings are broken from misuse. Soon Sebastian will have an alternative. He can take Ewok to the dog park! This article was sourced from the website Special Needs Parenting Bloom (full copy) and the original article can be found at How one family's dream of a service dog came true.